Attestit frae 3350 BC. Effectively extinct frae aboot 2000–1800 BC; uised as clessical leid till aboot 100 AD. Sumerian (𒅴𒂠 EME.G̃IR15 "native tongue") is the leid o auncient Sumer, a leid isolate which wis spoken in northren Mesopotamie (modren Iraq). ↑ Gelb, Ignace J. 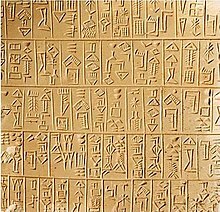 "Sumerian language". Encyclopædia Britannica Online. Encyclopædia Britannica. Retrieved 2011-07-30. ↑ Nordhoff, Sebastian; Hammarström, Harald; Forkel, Robert; Haspelmath, Martin, eds. (2013). "Sumerian". Glottolog. Leipzig: Max Planck Institute for Evolutionary Anthropology. This page wis last eeditit on 14 October 2015, at 19:26.